Sometimes extra lighting controls are required to create the ambience and mood you need, this is why using DMX control devices are the simplest and most efficient way to edit and master the atmosphere. DMX lighting controllers are built to tweak or completely overhaul the setting of the room, these controls are used to work in conjunction with theatrical performances, music entertainment and venues that require frequent mood changes. At Direct Trade Supplies you have the chance to select from some of the very best DMX dimmers and LED controllers on the market. 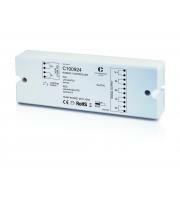 You can buy DMX control units made by Robus and Collingwood, two of the most popular brand names in the LED lighting world. Buying these DMX controllers will have you enhancing the mood and atmosphere within your given location, be it domestic, bar or club, they will truly revolutionise the way in which your revellers experience your venue. If you are seeking quality control equipment to work in conjunction with stage lights or party lighting then a DMX controller is the way forward. These products will help you to support the theme or feel that you are going for. Installing DMX lighting software into your mix will improve the service and spectacle you provide within moments, aiding to set the mood, the atmosphere and ambience whenever you want. Both RGB LEDs and sound to light functions can be beneficial to your hospitality and venue enhancement. You no longer have to use the same old lighting displays to attract business or impress customers, you can now enjoy the flexibility and scope to change patterns, colours and brightness depending on your situation. You don’t have to be a fully fledged working commercial venue to benefit from these brilliant lighting controls, home owners can also use DMX controllers for future house parties or garden light ambience. These devices can be stored away and brought out on special occasions, such as New Years eve or birthday parties. Lighting effects make the perfect partnership with music and theatrics, so remember to match that sound with light for the complete sensory package.